It's Not A Diary. It's A Movie. The hysterically funny, best-selling book comes to life in this smash-hit family comedy! Greg Heffley is headed for big things, but first he has to survive the scariest, most humiliating experience of any kid's life - middle school! That won't be easy, considering he's surrounded by hairy-freckled morons, wedgie-loving bullies and a moldy slice of cheese with nuclear cooties! $22.126 million on 3077 screens. Adapted from the popular series of Jeff Kinney novels, 2010’s Diary of a Wimpy Kid introduces us to Greg Heffley (Zachary Gordon), the titular pre-teen. The newly minted middle school student dreams of his future popularity as he envisions his move up the social ladder. Alas, reality works differently. 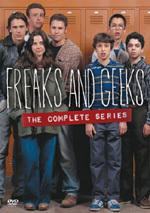 Burdened by his innocent childish friend Rowley Jefferson (Robert Capron), Greg encounters an awkward transition. We follow Greg’s year as he attempts to discover ways to earn popularity. Given that I’m more than three decades past its target audience, I can’t claim much familiarity with the Kid novels. However, I’ve seen enough of them to realize that they’re simple books that tell pretty unvarnished tales of adolescence. Part of their charm seems to be that they don’t throw in misty-eyed memories of childhood; they nail the ugly truth. Which the film seems to miss much of the time. When Kid starts, it does so pretty well. Actual youths can identify with the various situations, and adults can look back and recognize their own lives in the material. Make no mistake: while we oldsters like to gripe about “kids these days”, the basics never change. Adolescents are just as petty and weird as they were decades ago. The film’s observations about the basic facts of middle school life work the best. The idea of the “cheese touch” is absolutely nuts – but also absolutely believable. It’s the kind of thing that as an adult, you look back and think “who cares if someone touched the cheese?” but as a kid, that was life or death importance. Unfortunately, as Kid progresses, it loses the basic cynicism at its heart. Greg should be a pretty cynical, fairly ruthless character; he seems invested in surviving middle school with popularity intact above all else. That theme dominates the film, but in a lackluster manner. The movie’s Greg just doesn’t seem as willing to be popular at all costs as he should be. Which occurs because the flick entertains a sentimental side that seems to be absent from the books. In the commentary, director Thor Freudenthal discusses this; he feels that the movie needed to be less caustic just because… well, that’s how movies are. I disagree. I don’t think Greg should be a vicious little sociopath, but I feel that when the movie invests in goopy thoughts about Being Yourself No Matter What, it loses the energy and tone that made the books popular. While I don’t believe movies should be carbon copies of source texts, I think that the change that occurs here harms the film. It takes a hilariously unsentimental view of adolescence and turns it into just another tale of pals and doing the right thing. I think the lack of edginess affects the performances as well. There’s a big broadness to much of Kid that doesn’t suit it well. Of course, to some degree the material’s intended to be over the top; after all, it’s adolescence as seen through one kid’s eyes. Nonetheless, I get the feeling the filmmakers felt it best to opt for silly laughs instead of cutting humor. Even with its soft edges, Kid provides a reasonably entertaining experience, and I suspect the youngsters in its target audience will feel less disappointed with its toothlessness. I suppose I should be happy that a “kiddie movie” like this works as well as it does, but I still wish Kid went for the jugular more than it does. What could’ve become a kid classic of sorts turns into just another pleasant diversion. Diary of a Wimpy Kid appears in an aspect ratio of approximately 1.85:1 on this Blu-Ray Disc. I thought the image looked fine but unexceptional. Sharpness was generally positive. At times, I noticed a bit of softness, especially in wider shots. Still, the majority of the flick looked pretty concise and distinctive. No issues with jagged edges or moiré effects occurred, and edge enhancement was absent. I also failed to detect any source flaws. In terms of colors, the movie featured a natural palette that favored a slight golden tone. Across the board, the hues looked positive. They showed nice clarity and breadth and came out well. Blacks were dark and deep, while shadows appeared clear and smooth. The occasional softness created some distractions, but the transfer usually seemed solid. I thought that the DTS-HD MA 5.1 soundtrack of Wimpy Kid worked fine but it didn’t excel because of a lack of ambition. Like most comedies, the movie featured a limited soundfield that favored the forward channels. It showed nice stereo spread to the music as well as some general ambience from the sides. Panning was decent, and the surrounds usually kicked in basic reinforcement. A few scenes opened up better, though, such as when the flick entered into fantasy territory; those sequences boasted involving material. A rainstorm also boasted nice breadth. However, most of the movie stayed with limited imaging. Audio quality appeared good. Speech was natural and distinct, with no issues related to edginess or intelligibility. Effects sounded clean and accurate, with good fidelity and no signs of distortion. Music was perfectly fine, as the score and songs showed positive dimensionality. This track was good enough for a “B“ but didn’t particularly impress. When it comes to supplements, we launch with an audio commentary from director Thor Freudenthal and writer Gabe Sachs. Both chat together for this running, screen-specific take on story issues and adapting the source material, cast, characters and performances, sets and locations, visual choices, production design and costumes, various effects, music and other notes from the shoot. While never especially scintillating, Freudenthal and Sachs toss out a reasonably engaging commentary. The director dominates and we get a good general overview of different subjects. The track peters out a bit as it goes, but it still covers its topics in a satisfying manner. We find lots of footage under Deleted Diary Pages. This area provides 10 segments: “Fregley’s Scavenger Hunt” (2:56), “Chirag’s Trail of Tears” (2:37), “Fregley’s Shuffle” (0:47), “Mom Drops Greg Off at School” (0:55), “Greg and Rowley Jump Over the Wall” (0:26), “Mr. Winsky’s Safety Patrol Assignment” (0:23), “Mom Suggests a Friendship Card” (0:44), “Greg Meets Fregley’s Mom” (0:37), “Greg Has The Cheese Touch” (0:38), “Rowley’s Lost Zow-Wee Mama Cartoons” (five frames). Note that clips four through nine are the only actual “deleted scenes”. The first three are video clips I guess were meant as little teasers for the movie; I don’t know where they were used, but they offer video testimonials from the characters and clearly were never intended to be in the theatrical flick. These aren’t great, but they’re enjoyable. In addition, “Cartoons” shows five frames of Rowley’s art. They’re quite amusing in a stupid way. As for the six true deleted scenes, they’re mostly negligible. “Touch” is the most interesting, as it shows the aftermath of Greg’s big decision. It’s not a bad capper; I’d be curious to know why it got the boot. A few ads open the disc. We get clips for Ramona and Beezus, The Chronicles of Narnia: The Voyage of the Dawn Treader, Marley and Me: The Terrible 2s and Marmaduke. The trailer for Kid also pops up here, and we also get promos under Sneak Peeks. That domain tosses in previews for Tooth Fairy and Percy Jackson and the Olympians: The Lightning Thief. A second disc offers a DVD Copy of Kid. This appears to be the same disc that you’d buy commercially, not a “dumbed down” one intended just for this set. If you want to own Kid but aren’t yet Blu-ray capable, it’s a good bonus. Finally, a third platter provides a Digital Copy of the movie. This allows you to transfer the film to a computer or portable gadget. And there you go! 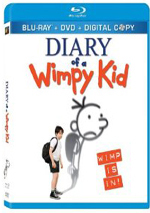 Inside the Blu-ray’s slip case, you’ll find Diary of an Awesome, Friendly Kid, a look at Rowley’s diary. Basically this shows us what a little turd Greg is through Rowley’s dewy fresh eyes. It’s funnier than the actual movie. Though the books on which it was based tend to be pretty unsentimental, the cinematic Diary of a Wimpy Kid lacks similar bite. It still offers decent entertainment; I just wish it’d come across as a little edgier. The Blu-ray provides good picture and audio along with a reasonably useful set of supplements. Though more enjoyable than I expected, the movie fails to live up to its source material.